The restaurant supply superstore carries different Rice and Bean combinations for your restaurant or home. The are high quality, great tasting and packed bulk for foodservice users. Choose your flavor of beans and flavor of rice to make great mexican dishes. Zatarains Red Beans and Rice Mix - 30 Oz. 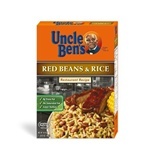 Mars Foodservice Uncle Bens Red Beans and Rice 24.9 oz. Zatarains Red Beans and Rice Reduced Sodium - 30 Oz. Rice and Beans are a great side dish for your restaurant.